Last week I downloaded the book We First by Simon Mainwaring, and have been inspired by his writing! Mainwaring talks about the current Capitalist system, and how it is an archaic, eroding system. This system must be changed, according to Mainwaring, if we are to learn from the lessons that the “Great Recession” has tried to teach us about the shortcomings of North American Capitalism. 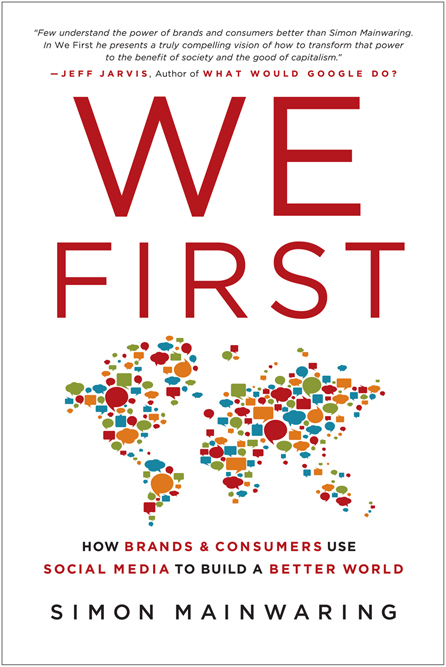 Basically, “We First” is the opposite of the Capitalist “Me First” mentality. Where I find Mainwaring’s philosophy interesting is the intersection of a new economic and fiscally responsible governing system, and the power of social media to help enact this change. Before we were able to talk, our parents told us to “do unto others as you would have them do unto you.” Whether you knew it or not, this saying came from the Judeo-Christian faith, along with other sayings such as “you sow what you reap.” Mainwaring posits that social media has reignited not only the idea of “do unto others as you would have them do unto you”, but also puts those words into action. Through the power of social media, corporations – the strongest beneficiary of the Capitalist movement, lose control of what is being said about their brand. No longer does the corporation have the final say. Social media is the strongest facilitator of word-of-mouth, and corporations feel threatened by this loss of control. An example of the power of social media in bringing corporations to heel is the 2010 Nestle debacle with Greenpeace. Greenpeace discovered that Nestle used palm oil in their recipes and started a social media campaign against the company using Facebook and YouTube. Greenpeace posted a video on YouTube of the famous KitKat slogan “Break me off a piece of that KitKat bar”, but instead of a chocolate bar, they were breaking off an orangutan’s finger. Orangutans were said to be going extinct because of the deforestation of their habitat in Malaysia and Indonesia, due to the company’s use of palm oil in their recipes. Social media acts as a catalyst for change. Before the advent of social media, it would have been business as usual for corporations, but with increased access to information and social media, a voice is given to the People, and corporations are listening – not necessarily because they want to – but because people demand it.